Moving into residential care from 1 January 2017? Think twice before deciding to rent out the former home. Australians who enter residential care from 1 January 2017, and who intend to rent out their former home while making periodic accommodation payments, will have Centrelink implications to consider, according to IOOF. Classification as a home owner will be limited to two years (or until the home is sold) unless the client’s spouse continues to live in the home. At the end of two years, the client becomes a non-home owner and the net market value of the home will be fully assessable under the assets test. Entering into residential care prior to 1 January 2017 – grandfathering. 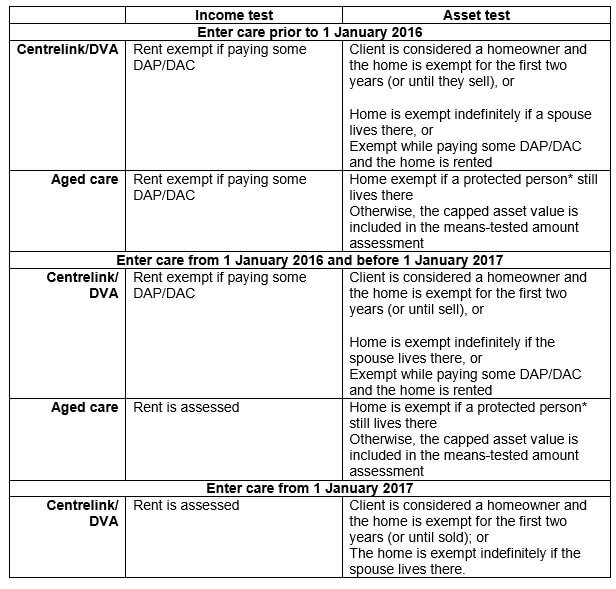 Clients who entered residential care before 1 January 2017 and are renting out their former home (not necessarily prior to 1 January 2017), while paying some daily accommodation payment (DAP) will continue to be assessed as having home owner status beyond two years and will have the rental income exempted when determining the amount of eligible income support. Meg enters care in June 2016 while David remains living in their home. Meg pays part of her accommodation payments as periodic payments (DAC/RAC). In February 2017, David needs to enter into care. He also pays part of the accommodation payments as DAC/RAC. They decide to rent out their home. Because Meg entered care prior to 1 January 2017, David may also benefit from Centrelink exemptions (notwithstanding that he entered care after 1 January 2017). Grandfathering rules allow both members of a couple to benefit from income and asset test exemptions on the rental of the former home while they are paying a DAC/RAC. Upon the death of Meg on 1 January 2020, David’s home assessment reverts to the usual two-year rule. This means that as Meg died more than two years after David entered care, David’s exemption will end from Meg’s date of death, on 1 January 2020. Advisers may have clients contemplating entry into a residential care facility in the next twelve months or so. It is worth considering the impact of these changes and have your clients enter care before 1 January 2017 to take advantage of grandfathering. Loss of these exemptions, coupled with changes to the assets test from 1 January 2017 could result in a significant reduction or loss of the age pension, thereby increasing the cash flow constraints for clients when funding their care fees (notwithstanding some positive flow through benefits on the means tested care fee from the reduced age pension). Clients who move into care after 31 December 2016 may find it more difficult to fund their care fees if they do not want to sell their former homes and other financial resources are limited. Alternatively, borrowing options to fund care costs via a reverse mortgage, borrowing from children or home equity release options may need to be considered. Further, the incentive to pay a lump sum refundable accommodation deposit (RAD) instead of DAPs may increase under the new rules to access asset test exemption for the RAD under the Centrelink/DVA rules and requesting the DAP to be deducted from the RAD to assist with cash flow. Note the value of the RAD is assessed for the means tested care fee. 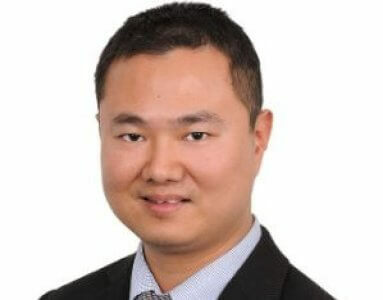 Advice on aged care funding and cash flow management will become even more critical for the client and their families. * Protected person: 1. Spouse or carer (two+ years), close relative (five+ years) and eligible for income support payment. Deb is a widow who lives alone. She needs to move into residential care and agrees to an accommodation payment of $400,000. She decides to pay her accommodation as a RAD ($50,000) and DAP of $21,035 per year or $57.63 per day (based on $350,000 x 6.01 per cent / 365). In addition to her home, which is valued at $850,000, she also has $120,000 in a bank account. Deb and her family decide to keep her former home and rent it for $22,000 per year (net of expenses) to pay for her accommodation. She currently receives the full age pension of $22,805 per year. The table below compares the difference in fees and cash flow if Deb enters care over the following periods. Please note, for simplicity, rates and thresholds current as at 20 September 2016 have been used across all periods. The table shows the different assessments over the various periods create different outcomes for Deb’s age pension, means tested care fee and cashflow. For the first time, Centrelink rules will change to align with the assessment of aged care when clients decide to rent out their former home while paying periodic accommodation payments. Where possible, clients should consider moving into care prior to 1 January 2017 to give themselves more choices and favourable Centrelink concessions. Advice on aged care funding and cash flow management will become even more critical for clients and their families. 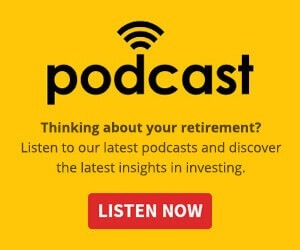 How should I adapt to the new age pension test?